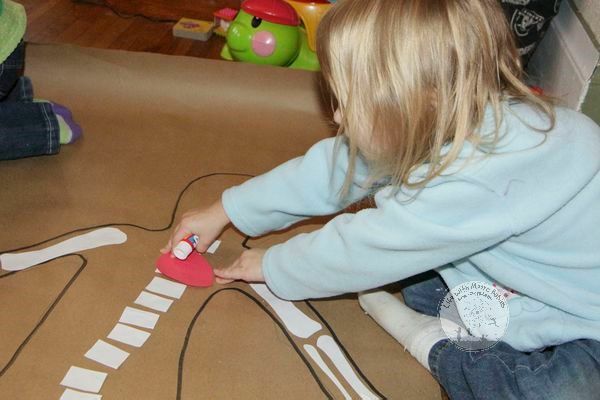 A logical choice for our letter D Community Helper was a Doctor. 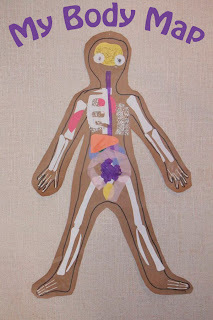 But there is a lot to learn before you can be (or pretend to be) a doctor, so we started our learning with these life size body maps. 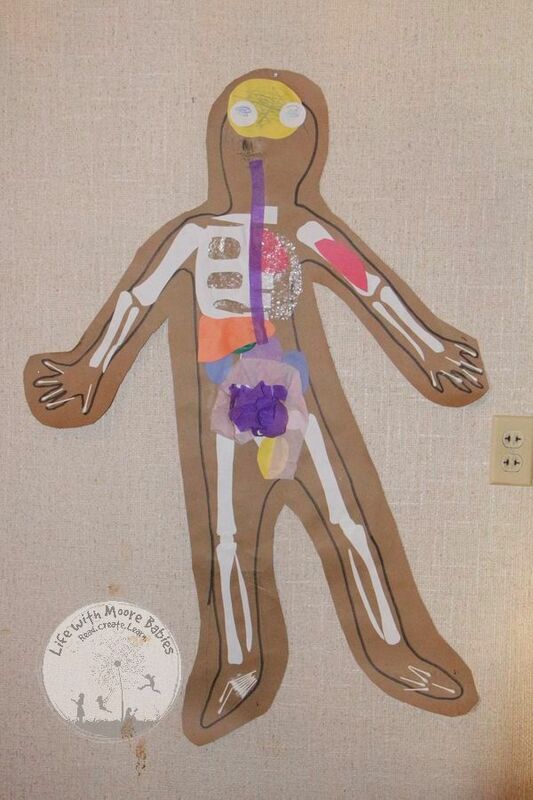 I don't know about you, but knowing how the body works is definitely something I want my kids to understand. 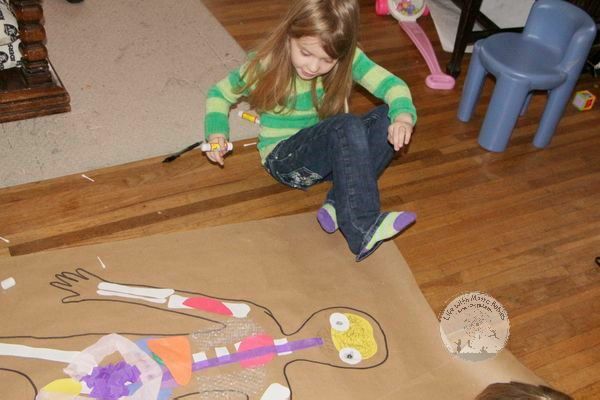 Creating a map of their body is a fun introduction to different parts of the body; plus you start talking about function. 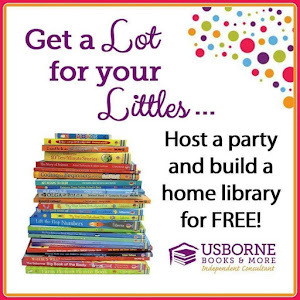 Since I was doing this with 2 preschoolers I made sure to prepare everything ahead of time. They helped cut, but I had everything gathered. It still took a couple hours to assemble but could certainly be done over a few days if you have a safe place to keep them. 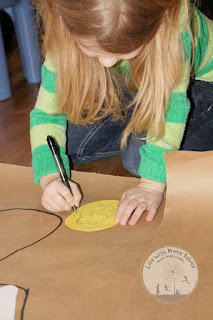 I started by drawing an outline of each of the girls on a piece of brown craft paper and tracing it with a black marker. We actually did this step the day before. Having just one piece done made the task a little less daunting for me! I also needed it to prepare the bones. 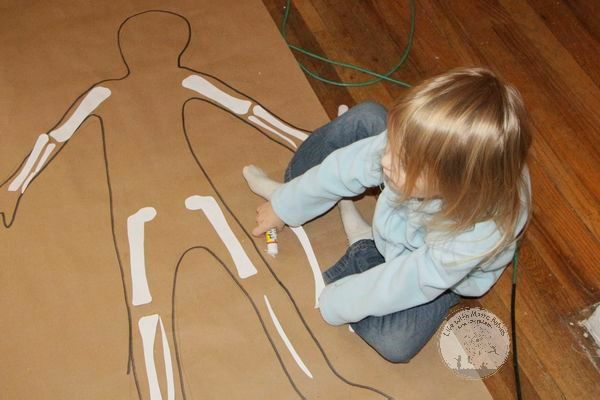 Then I measured their arms and legs to know about how big to make the bones. I drew a rough outline of the arm and leg bones on white paper, folded in half, and cut two of each. 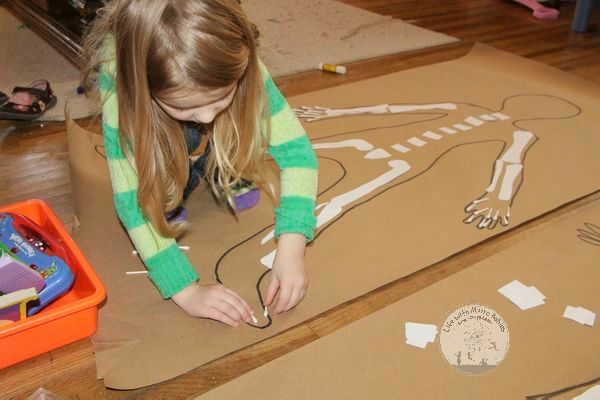 We glued on the bones for the arms and the legs, and I had them add little rectangles for the vertebrae. You can see how unrealistic this is when you count that they have like 8 or so vertebrae. I did add a little triangle for the tail bone. We talked about having a pelvis bone, but I didn't add one. It would have just been covered up! The kids didn't care how accurate it was, just the resident science nerd (me). 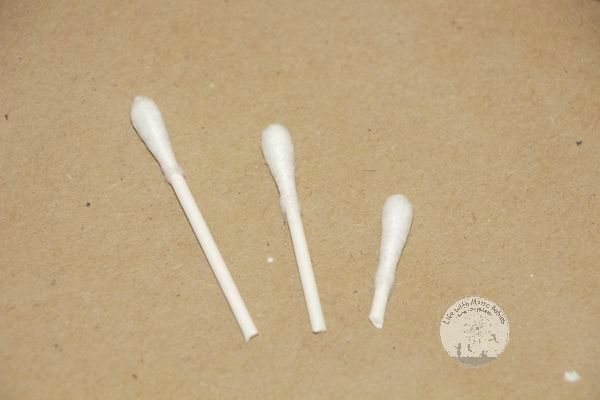 I cut Q-tips for the fingers and toes. I cut them in three size, and used the shorter two for fingers and the longer two for toes. Again not real precise as we only had 2 in each finger and no hand or foot bones, but it is just an anatomy introduction. Now we moved onto the organs. I don't know if their is a right order to do this in as we did end up doing some re-gluing along the way to get things to fit. 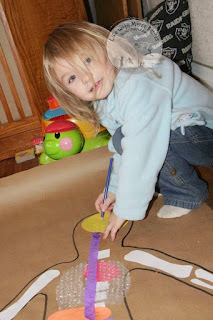 We started by adding a heart which I cut out of red paper. The girls were confused because it didn't look like the "heart" shape they know. I showed them a picture of an actual heart and they were fine with it! We added some bubble wrap lungs. 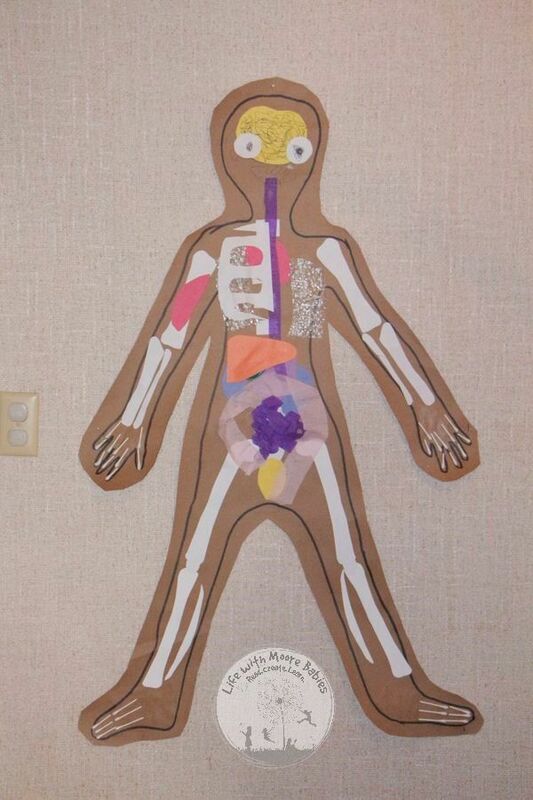 Then we moved on to the digestive system. I cut them both stomachs (purple construction paper) and then realized they might need kidneys (blue construction paper) first. SO we went back and added some kidneys, then a stomach. I told you we had to do some re-gluing. Then I had them add a liver (orange construction paper) with a little green balloon piece for a gallbladder. The gallbladder is completely unnecessary for this project, but I thought it was cute (again with the science nerdiness). 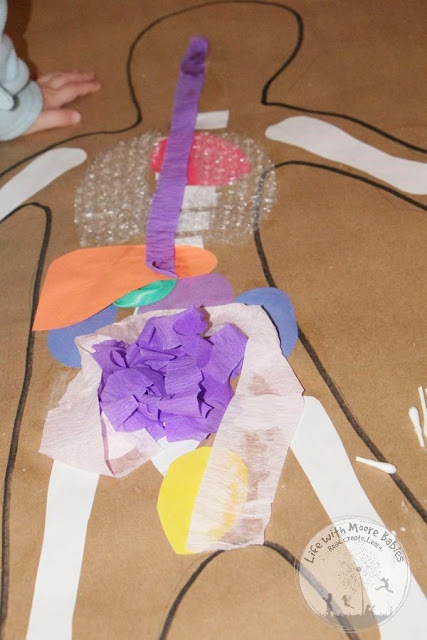 For the esophagus and small intestine, I cut crepe paper streamers in half. 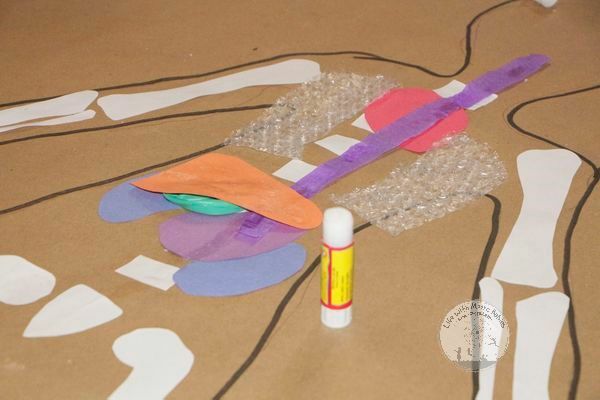 We went to add an esophagus and ran into problems because of our liver. 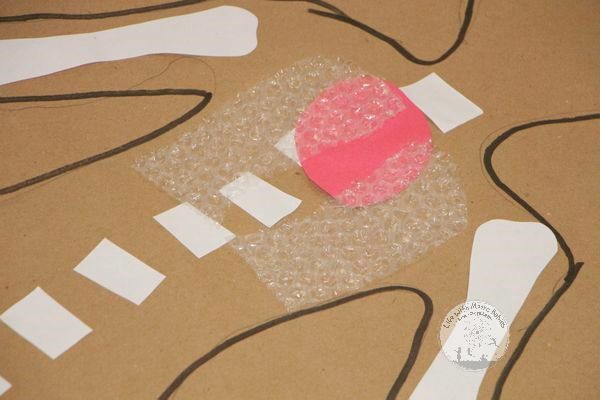 So, at least on one, we had to remove the liver, add the esophagus, and replace the liver. Yep, more re-gluing. 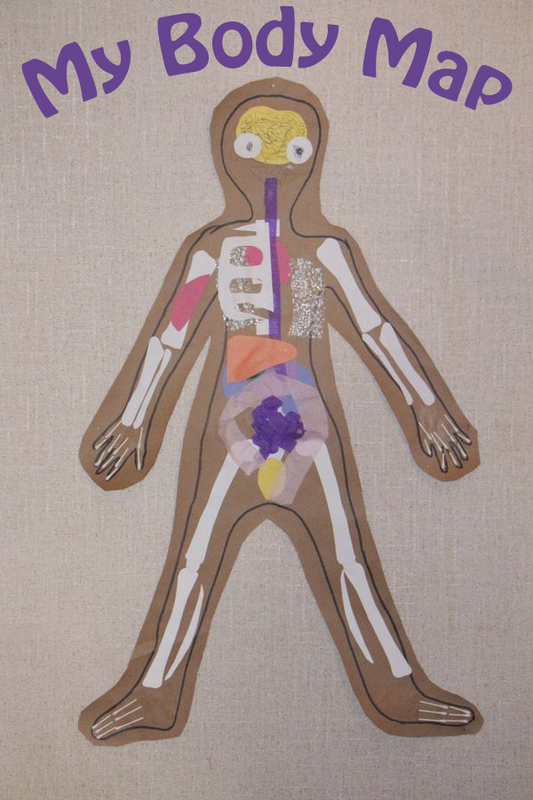 We just added a wad of crepe paper streamer for the small intestine. SO scientific I know, bit I don't think the girls really cared about the different portions of small intestine. I am happy if they remember it IS small intestine! Plus the crepe paper does have a similar look to the inside of the intestines with all the folds. Added a different colored (and uncut) streamer for the large intestine. And look we haven't added a bladder. Well I realize in real life the bladder would sit in front of the large intestine, but we couldn't get it to stick to the crepe paper as well. So we went ahead and added it and then glued down our large intestine. 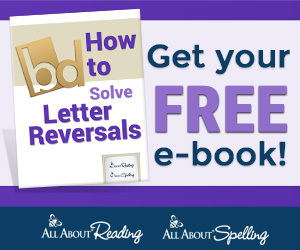 We moved back up to our head after completing our digestive (and urinary tracks). 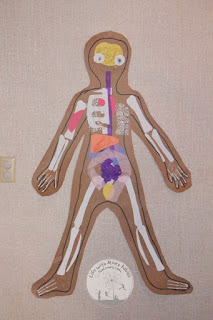 The science nerd in me knows we left out a few things (pancreas, adrenal glands, etc), but I think this was a lot already for a 4 and 5 year old! They wanted a yellow brain, so I cut one out of paper and let them draw in the gyri. We added white circles for eye, and they drew on a pupil. We were going to use beans for teeth, but they chose to just draw on mouths instead. Somewhere in there I cut them a little muscle to add to one of their arms. I could tell they were tired when they asked if we could just do one muscle! 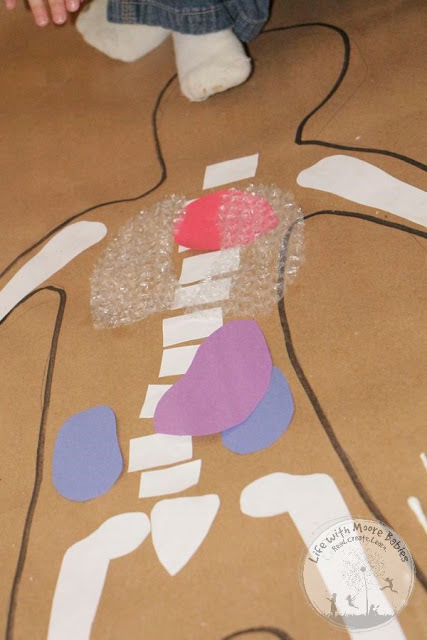 We also added half of a rib cage, so they could see how the ribs protected their heart and lungs. I asked if they wanted half of a skull, and they said no. So we were done! We hung them on the dining room wall, so we can use them to review. I have a feeling people may not want to have dinner here for a while unless they like being starred at by the bodies on the wall! Like I said, we did some re-gluing due to poor planning on my part. 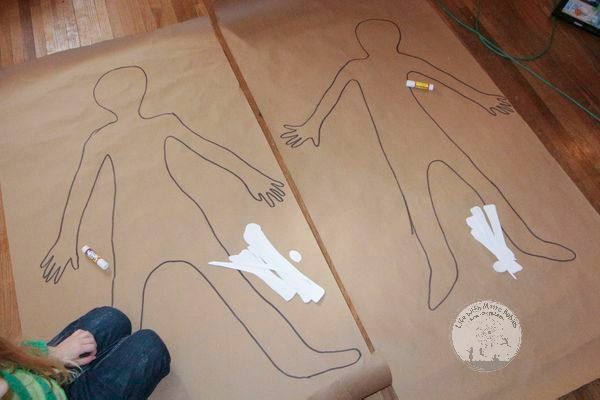 If you want to only glue once I would add organs in this order. 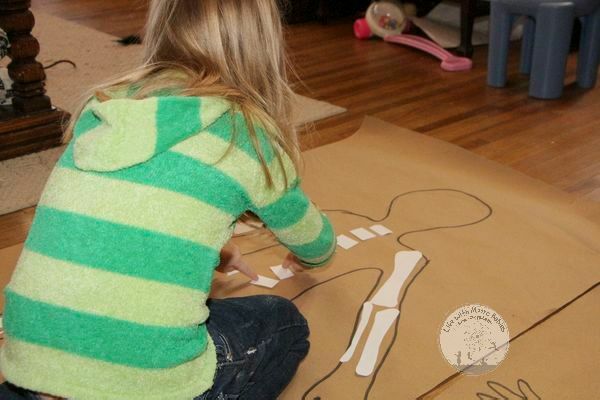 Even being an incomplete body (from the science nerd perspective) making body maps was such a great, hands-on way of introducing anatomy to the kids.